As a ballroom dance instructor, I’ve found that the most difficult thing for people to learn is to unlearn a bad habit. Changing the way we always do certain things takes time and effort. Whether you’re a seasoned ballroom dancer or learning your first box step, we all have some bad habits that we are trying to break. Below are 5 of the most common mistakes or bad habits that students make during dance lesson. Duet Dance Studio's students, Vianna and Peter, learning to dance for their wedding. Many beginning ballroom dancers tend to look down at their feet, unsure of where they should move, and afraid to step on their partner. This can be a difficult habit to break. Looking down affects your posture, causing shoulders to hunch forward and weakens the dance frame. 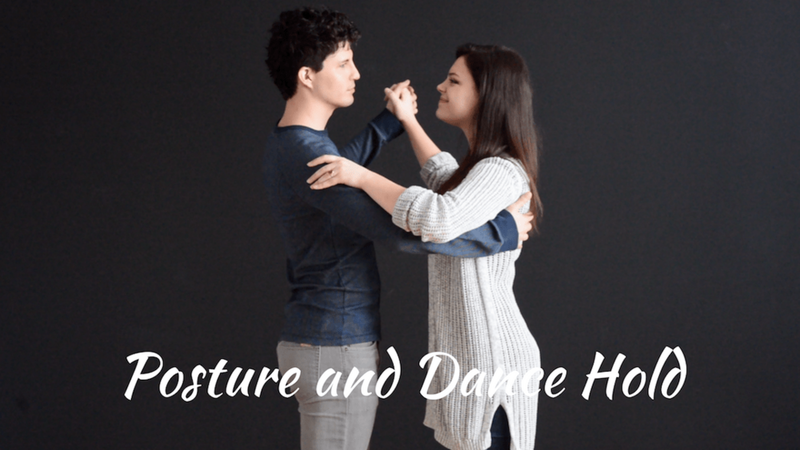 The goal of social dancing is to use your body to communicate everything to your partner--try to feel where your partner is moving in order to determine where to place your foot, rather than allowing your gaze to fall to the floor. A good way to practice looking up is picking a focal point that’s high up in the room, such as a clock, a window, or your partner’s smile! Your dancing will be much smoother, and you will be able to focus on your partner’s face, rather than their feet! The dance frame is the most important part of ballroom dancing. The frame is the main way leader and follower are able to communicate on the floor. Therefore, both partners need to maintain strength in their arms and backs. If dancers let their elbows lose tension, the lines of communication are broken and partners are unable to relay messages. A good exercise for this is to stand facing a wall. Lift your arms in front of you, place palms on the wall and lean forward slightly, shifting your weight toward the wall (almost as though you were doing a push up). This kind of strength and resistance will keep your frame strong and allow you to work with your partner more easily on the dance floor. A lot of us carry our tension, stress, or anxiety in our shoulders. While we dance, sometimes we start focusing so much on footwork, frame, looking up, etc, that the stress of it begins to show in our shoulders. It’s very common for shoulders to tighten and raise up toward the ears, creating a very scrunched upper body. If this happens, take a moment to breathe and relax, rolling the shoulders back and down. Imagine squeezing a baseball between your shoulder blades, which then turn into butter and melt down your back. This opens up your chest and creates a nice, long neck. In dance, we always want to lengthen! You’ll immediately look more confident and poised. This is a hard habit to break, especially if you have long legs! Often, beginning dancers take very wide steps. This makes dancing difficult because it can throw you off balance and cause you to move too slowly with the rhythm of a song. Plus, if you step too far it can be hard for your partner to keep up, or you may step on their toes (ouch!). Try keeping steps a bit smaller until you feel really comfortable with the tempo and your partner is able to match you step-by-step. Their legs (and toes) will thank you for it! Sometimes during a dance lesson, it’s easy to get caught up in perfecting each step--repeating it multiple times trying to nail it. However, some steps are complicated and troublesome to learn. When you encounter these figures, it’s natural to feel frustrated. Many dancers “hit a wall” when they’re unable to improve a step or don’t catch on quickly. When this happens, rather than continuing to drill the step, it can be more helpful to stop and take a break for a few minutes. Have a drink of water, grab a snack, and sit down for a second. Then return to the dance floor with a clearer, calmer mind and try again. You might find the step easier than it was before! What is your bad habit when learning to dance? And how do you break that? Please comment below. This post was written by Duet instructor, Grace Lethiot.